Wi-Fi has been a game changer. We can browse the Internet from anywhere in the home or office, lookup recipes while in the kitchen, even connect our light bulbs to it so we can control them via our voice. But is your Wi-Fi as good as it can be? It’s been around 15 years since Wi-Fi was first introduced into our homes and businesses, and since then it’s evolved into something that we can’t live without; laptops, desktops, phones, TVs, smart devices, printers, gaming consoles all connect to it. However, as soon as you start adding devices that require a lot of bandwidth such as 4K TVs or gaming consoles, things can slow down quickly, and your Wi-Fi can grind to a halt. Yet most people measure their Wi-Fi speeds by how many bars they’ve got, and so when things slow down, they blame the ISP. Why measuring bars doesn’t determine how quick your Wi-Fi is? The bars simply show signal strength, not the speed of your Wi-Fi or Internet. While it’s great having a strong signal, it doesn’t tell you how fast and reliable the signal is. It also doesn’t consider how many other devices are fighting for the same bandwidth. 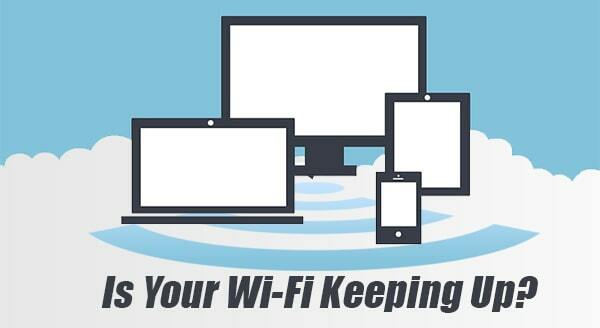 Other Wi-Fi networks can affect the speed and reliability of your Wi-Fi. All these Wi-Fi networks are competing on the same channels and frequency. As I type this in the office, I’ve got 15 wireless networks that I could connect to. All of them fighting and causing interference with one another. If you live or work in an area with a lot of Wi-Fi networks, simply changing the channel to one with less cross-talk can seriously boost the speed of your Wi-Fi. All routers provided by your ISP are simply plug and play, in other words, you don’t have to configure them. Yet most use the 2.4Ghz frequency and use channel 1 or 6. By switching to the 5Ghz frequency (if your router and devices support it), you can reduce interference and as an added bonus, the 5Ghz range is considerably quicker. If your Wi-Fi is not up to scratch, give us a call on 01543 889 444 and we can help improve the speed of your Wi-Fi.